Searching for stay at home mom jobs while you have young kids at home? If you’re a mom, then you know finding peace and quiet isn’t something that comes easy. When it comes to working from home, many jobs require you to answer phones or work in a quiet environment. For those of us with a (ahem!) noisy home, this just isn’t going to happen! This quick list is filled with ideas for you that you can do from home, as your time permits, even if your home is busy and loud. I’m a mom to some noisy (but pretty amazing) boys, so I understand it can be challenging at times. Be sure to scroll to #9 and see which one job I picked; I love it! Pet sitting is far from a glamorous job, but people need pet sitters! Watch people’s pets while they are at work, away for vacation, or even just when they have a full day of running errands. You can advertise in a local FB group, Craigslist, or at local humane societies and vet clinics. If your house is noisy, transcribing is out of the question. However, if you know another language, translating may be right up your alley! Fiverr is an option for offering small document translation. Whether it’s business pages or blog articles, you can make a full-time income just by writing articles for other people! If you need flexibility, this is a great option. Many bloggers are happy to have help with content creation for their site. Fiverr is another good choice for offering your writing services. There are also facebook groups that exist to connect freelance writers to bloggers who need help with writing blog content. If you have social media skills, administrative experience, or a number of other skills, put them to use by doing virtual assistant work for business owners. Get started by reading the book The Bootstrap VA. If you really want to dig deeper, you can learn how to manage facebook pages with Rachel Miller’s e-course FB Page Strategies. Completing her course will pretty much guarantee you a stay at home mom job, managing blogger FB pages or small business FB pages. Her results are incredible! If you have time to spare, consider running errands for people or doing other small tasks. The pay isn’t fabulous, but you can do it when you have extra time, and that little bit here and there can really start to add up. Sites such as Fiverr can help you earn money doing various small tasks from your computer. Locally, you can also let moms know you’re available to be a “mother’s helper” and help them with their tasks, especially moms who homeschool or do other work from home. You can do this while the kids are watching TV, while you’re in line at the grocery store, or whenever you have a free minute. You won’t get rich doing this, but you may be able to pay for your next meal out with your earnings! One popular site for surveys is Shopper’s Voice. They give you cash, coupons, samples, and more when you complete shopping surveys. Data entry is a great way to get things done while your house is in chaos. You can take your time and enter in data on your own schedule. You may need to do a little bit of research, and basic knowledge of spreadsheets will likely be a requirement. If you don’t have the quiet to have a phone job, why not an online chat agent? All your communication is over a computer, so it doesn’t matter how noisy your end is! You can do everything from customer service to answering questions. This is what I personally chose to do. Blogging isn’t a means to get rich quick, but those who are successful can earn a lot of money doing it! If you have a topic you’re passionate about, consider starting a blog and writing about it. 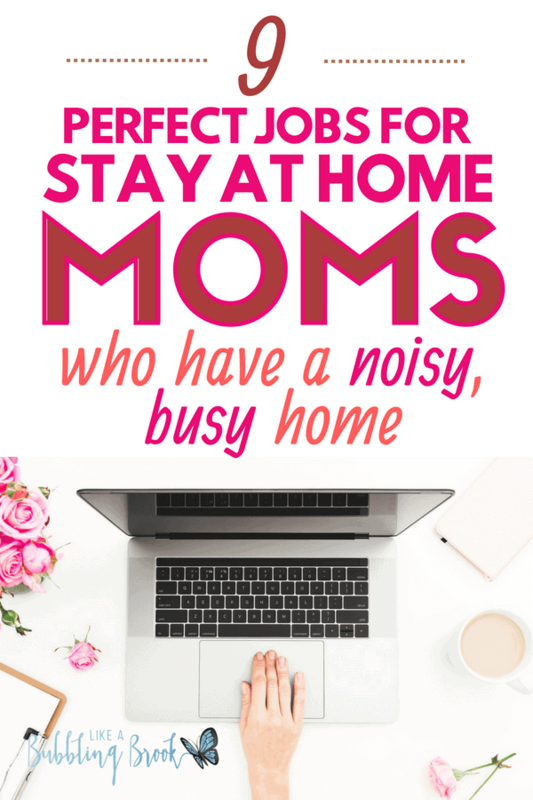 I make a good income from this blog being my “stay at home mom job,” and it continues to grow every month. If you’d like to learn more, read my post about How to Start a Blog. It’s actually quite easy to get started! Keep researching afterwards and learning how to do new things. You’ll keep getting better, and your income will increase each month. You don’t have to have complete silence in order to make money from home! These nine stay at home mom jobs are perfect for moms looking to make extra cash. Which one was your favorite? Have you tried any of them already? Whenever someone asks about getting started, I recommend this book and the one below. Either of them are great ways to get started on the path to financial peace. Includes a plan you can put into action TODAY. Dave Ramsey will inspire you and help you be what he calls gazelle intense. This one ties for my top two “getting started” books. It’s full of biblical wisdom and a plan for getting out of debt. So good! I stumbled upon this jewel in our local library and then found an out-of-print copy on Amazon. It’s one of the best kept secrets in personal finance books, in my opinion. I treasure this little gem!